The 20th century saw the rise of multi-lateral diplomacy. Within one century, the major European powers were bound together politically and economically in the European Union while all nations of the world convened regularly in the great halls of the United Nations. In addition, the Cold War led to the creation of two multi-lateral organizations still operating today- the OSCE and NATO. While the NATO alliance was formed in order to prevent Soviet expansion, by the end of the Cold War it had morphed into a diplomatic entity committed to spreading democracy throughout Europe. In recent months, however, NATO seems to be reverting to its original goal of preventing Russian expansion in Eastern Europe. Since Russia’s incursion into Ukraine, and subsequent annexation of Crimea, NATO countries and leaders have been maintaining a high media profile meant to demonstrate the organization’s ability to counter Russian policies. This includes conducting large military drills, maintaining air policing missions in NATO air space and de-legitimizing Russia. Much of NATO’s public relations work is conducted through its twitter channels as seen in the tweets below. 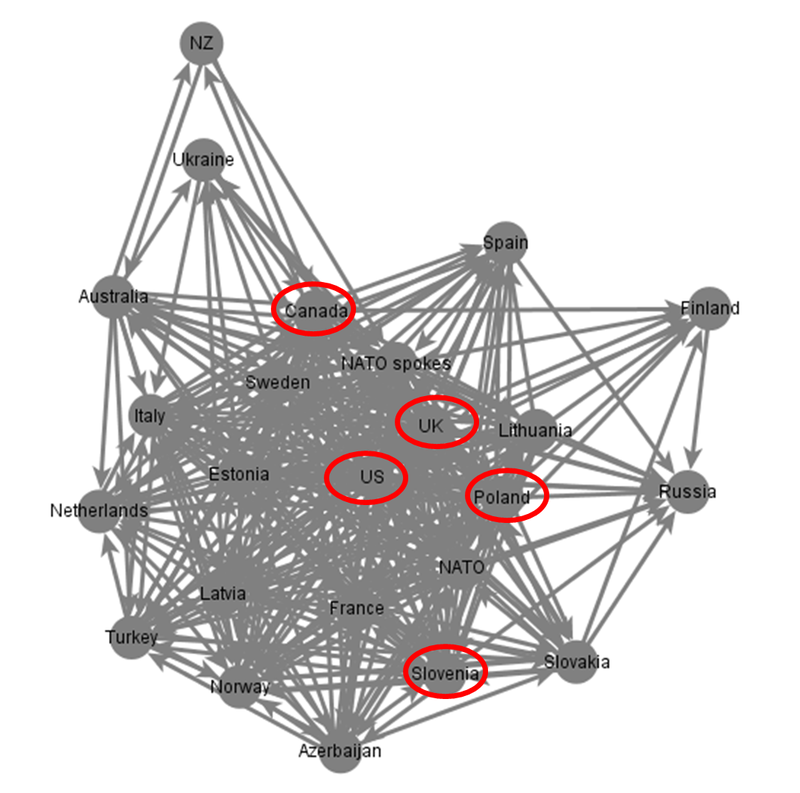 Given NATO’s use of twitter, I decided to explore the social network of world missions to NATO. Using lists comprised by Twiplomacy and NATO I created a sample of 24 twitter accounts operated by missions to NATO and NATO officials. I admit that I was somewhat surprised by the small number of mission to NATO that are active on twitter. The Sample may be seen in the table below. NATO’s social network can be seen in the image below. Given the relatively small sample used in this post, NATO’s social network seems to be rather dense indicating that missions to NATO form a close social network. Analyzing NATO’s social network called for calculating three parameters. The first parameter, in-degree, calculates the popularity of each member of the network. The more popular a mission to NATO the greater its ability to disseminate information to all other members of the network. 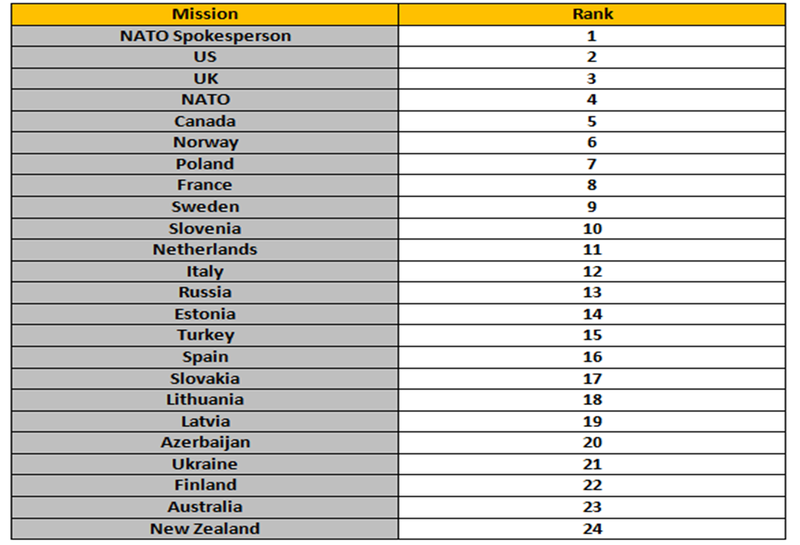 As can be seen in the table below, the five accounts with the highest in-degree score were NATO’s spokesperson, US mission to NATO, UK mission to NATO, NATO & Canada’s mission to NATO. 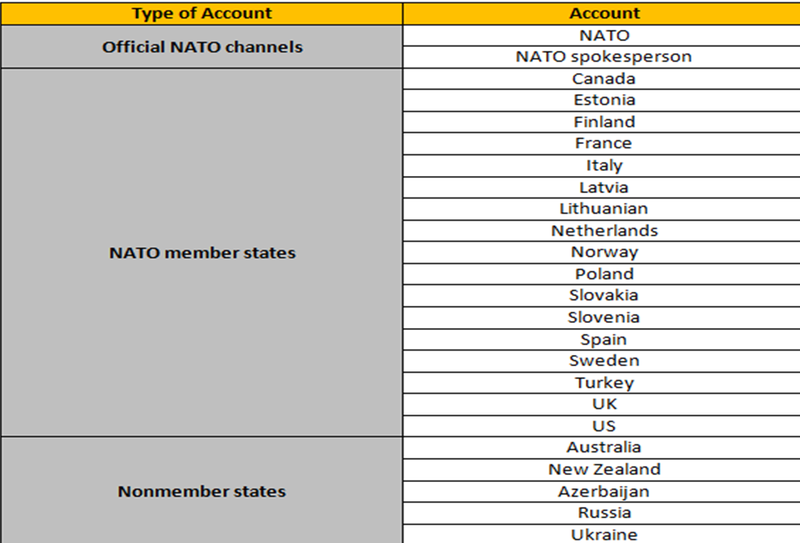 The following image locates the accounts with the highest in-degree score in NATO’s social network. The second parameter, out-degree, calculates the extent to which each member follows his peer in the network. The more of its peers a mission to NATO follows, the greater its ability to gather information from other members in the network. 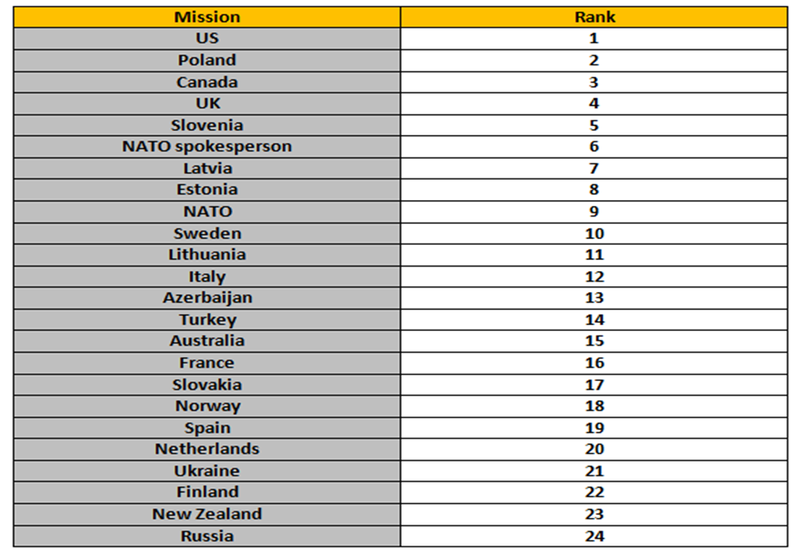 As can be seen in the table below, the five accounts with the heights out-degree score were US mission to NATO, Poland, Canada, UK and Slovenia. The following image locates the accounts with the highest out-degree score in NATO’s social network. The final parameter, betweenness, calculates which members of the network are major hubs of information as they connect members that do not follow one another directly. 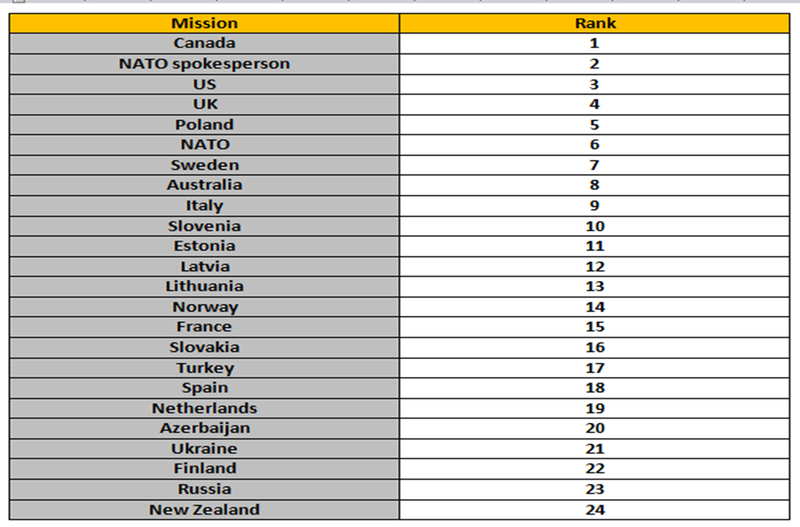 As can be seen in the table below, the five accounts with the highest betweenness score were Canada’s mission to NATO, NATO spokesperson, US, UK and Poland. The only three accounts to score high on all three parameters were Canada’s mission to NATO, US mission to NATO and the UK’s mission to NATO. It should be noted that NATO’s spokesperson scored extremely high on both the in-degree parameter and the betweenness parameter. This means that NATO’s spokespersons is able to effectively disseminate information throughout the entire network while also serving as an important information hub linking together mission to NATO that do not follow one another directly. Unlike NATO’s spokesperson, NATO’s official account (@NATO) did not score high on two of the three parameters evaluated in this post. This could indicate that @NATO is not an integral member of its own social network. Finally, it is interesting to note the relative peripheral location of Russia’s mission to NATO shown in the image below. One might have expected that given tensions between Russia and NATO, Russia’s mission would be one of the most popular members of this network. Russia’s peripheral location once again raises the question- do diplomatic institutions view following another country on twitter as a political statement? Posted in Uncategorized and tagged Digital Diplomacy, Multi Lateral, NATO, Network Analysis, social network, twiplomacy, Twitter. Bookmark the permalink. Nice work, as always. I’ve found it interesting to see the message put out via Twitter by the members/non-members. The US Mission, as well as some of the Eastern European ones, tend to focus on pictures of military maneuvers. I was also glad to see you included Russia’s mission. It seems to me that most of their tweets come all at once (and usually in the middle of the night), instead of throughout the day.